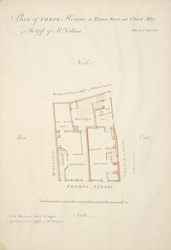 Plan of THREE Houses in Thames Street And Church Alley. The Gift of Mr Collins. bl.uk > Online Gallery Home	> Online exhibitions	> Crace Collection of Maps of London	> Plan of THREE Houses in Thames Street And Church Alley. The Gift of Mr Collins. This drawn plan depicts a property owned by the Haberdasher's Company, one of the City's of London's historic livery companies. These were trade guilds, many of which had existed since medieval times. The scale bar appears below the plan, with orientation points marked on the margins of the sheet. A pencil illustration of an oven has been added to the north side of Haniss Higgins' house.